I remember the first time I got my hands on a bottle of rosehip oil. My skin had changed quite a lot — it was dry when I was a teenager and then when I hit my twenties I was gifted with an oily T-zone I never wanted. I was stuck, but oils were having a moment and I’d heard they were beneficial for most skin types, including combination/oily. I gave into the hype and I’m glad I did; I find rosehip oil soothing, gentle, and not too heavy (when used sparingly). It’s never irritated my acne or breakouts, and it’s moisturising enough for the dry patches on my cheeks, too. Rosehip oil is extracted from the seeds of the wild rose bush or the dog rose. What are the benefits of rosehip oil for skin? Rosehip oil contains essential fatty acids, which can help to repair damaged skin tissue and regenerate skin cells. It also fights free radicals, which cause sun damage. How can I use rosehip oil? Apply a few drops to your face using your fingertips, massaging the oil gently into the skin. Rub it into scars, stretch marks, or dry areas such as your cuticles, or add a drop to your regular moisturiser for an extra hydration boost. This multipurpose oil is said to soften fine lines, provide moisture, and reduce stretch marks and scarring. I like to massage two or three drops of it into my face and neck before I go to bed, especially at this time of year when my skin feels the effects of the cold. I don’t really have fine lines yet, but I do have acne scars on my chin and dry patches on my cheeks, and over time I noticed that both were fading (and, in the case of the dry patches, pretty much disappeared). I broke out quite badly in December, so I want to use something less rich now, but Trilogy have just released a lighter blend which is designed to balance the skin, so I’m covered. Note: Rosehip oil contains retinoic acid, a derivative of Vitamin A, so be careful if your skin reacts badly to Vitamin A or retinol products. Rosehip, jojoba, camellia, evening primrose, honey, macadamia nut and calendula combine to create this exfoliant, which somehow manages to be one of the most gentle and most effective products I’ve ever used. The tiny micro-particles (‘non-abrasive jojoba micro-spheres’) really do get rid of dry skin without causing any irritation. I prefer to use liquid exfoliants on my face, but this is a wonderful product to use before you shave, particularly under the arms — I have fewer ingrown hairs now I use this on a regular basis. I wouldn’t recommend it for larger areas, but for concentrated areas like elbows and knees, or sensitive areas with thinner skin, like your chest, it works a treat. Note: LoveLula’s website says this product is suitable for vegans, but it contains honey. 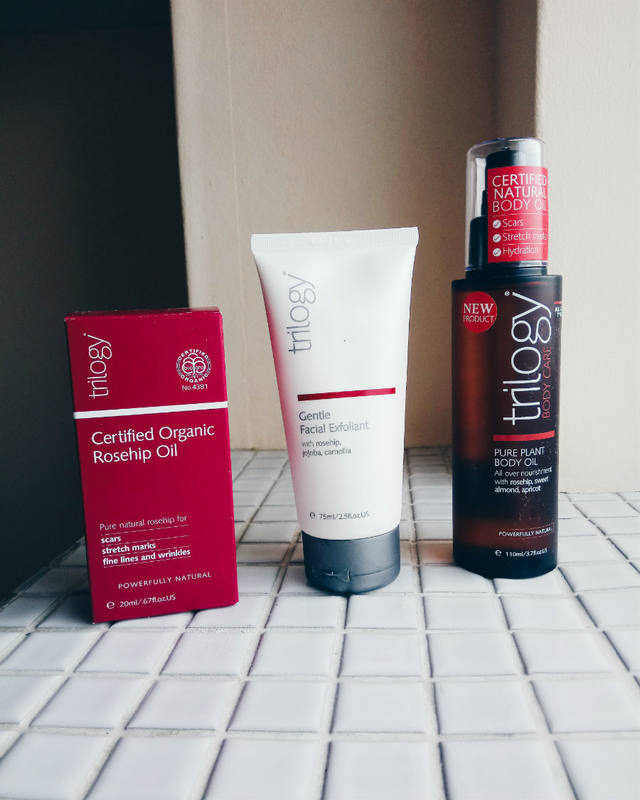 Trilogy’s Pure Plant Oil consists of three oils: rosehip, sweet almond, and apricot. Rosehip oil repairs and hydrates, sweet almond oil stabilizes the pH balance of the skin, and apricot soothes inflammation. I find it very moisturising, even on the roughest skin, and it calms down raised, red, itchy patches. It takes a long time to absorb, so I prefer to use it on lazy evenings when I’m doing the full works: hair mask, face mask, pedicure etc. There’s something quite decadent and Cleopatra-esque about going to bed having smothered your entire body in oil. As I write this, you can get a free rosehip cleansing set when you buy any two Trilogy products from LoveLula, so it’s the perfect time to test out some rosehip-infused goodies if you’re curious. Have you ever tried rosehip oil before? What’s your favourite way to use it? Let me know in the comments. *Products were sent to me by LoveLula for consideration of review. As always, all words and opinions are my own.